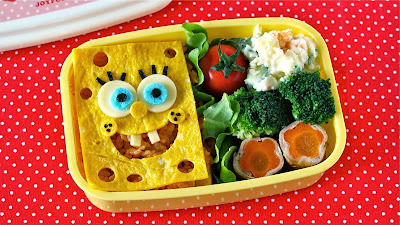 BTW, Omurice is very popular dish among kids. I hope you like this idea!!! 2. Cut the yellow egg crepe into a triangular shape. Then cut out a moon shape to make mouth. Cut out cheese, blue egg crepe, and Nori to make eyes. Cut out yellow egg crepe to make cheeks and nose. Make a few random holes in his face. Place it on the Chicken Rice packed in a bento box. Then place his tooth made with cheese to finish.